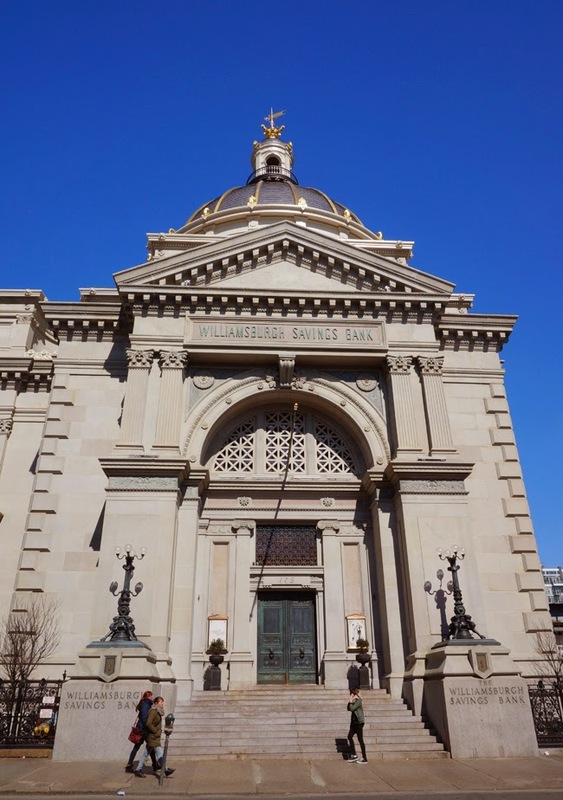 Andrew Dolkart, an architectural historian and author was quoted by the New York Times stating that the Williamsburg Savings Bank qualified as "one of the most significant buildings in American architecture". 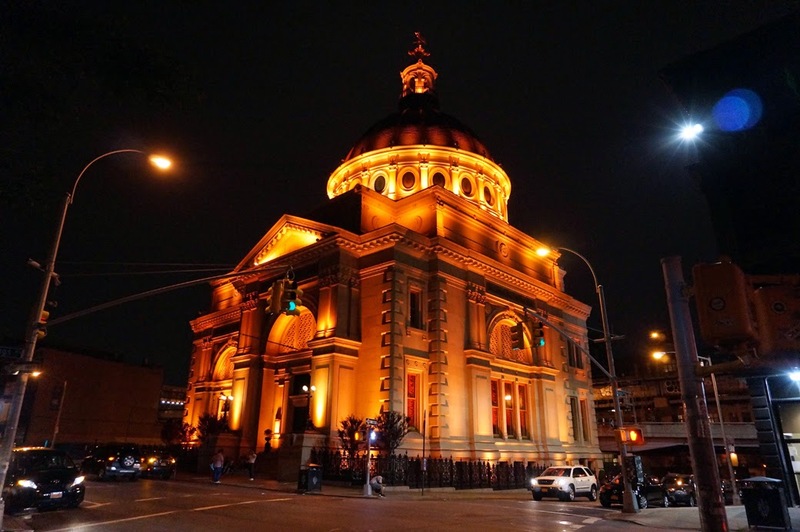 A precursor to the City Beautiful Movement of the late 1800s and early 1900s, the Williamsburg Savings bank was ahead of its time when it was built in 1870-1875. The bank, designed by George B. Post with two later additions (1905 and 1925) designed by Helmle & Huberty was a classically styled building with monumental proportions and a complex articulation of building elements more commonly seen in later Beaux Arts style architecture. 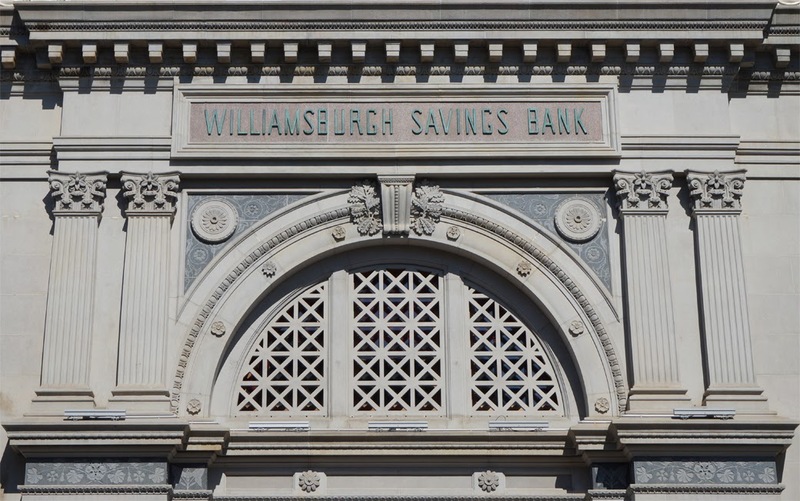 In addition to the Williamsburg Savings Bank, Post's career highlights included the headquarters of the New York Stock Exchange and early high-rises. Helme & Huberty's additions to the bank include the wing to the left of the main entrance. The bank has undergone two restorations in as many decades. The first restoration was financed by its owner, Republic Bank and executed by architects Platt Byard Dovell in the mid-1990s. To the credit of the banks various owners, little remodeling work was undertaken during the life of the structure, leaving the original interior design mostly intact. 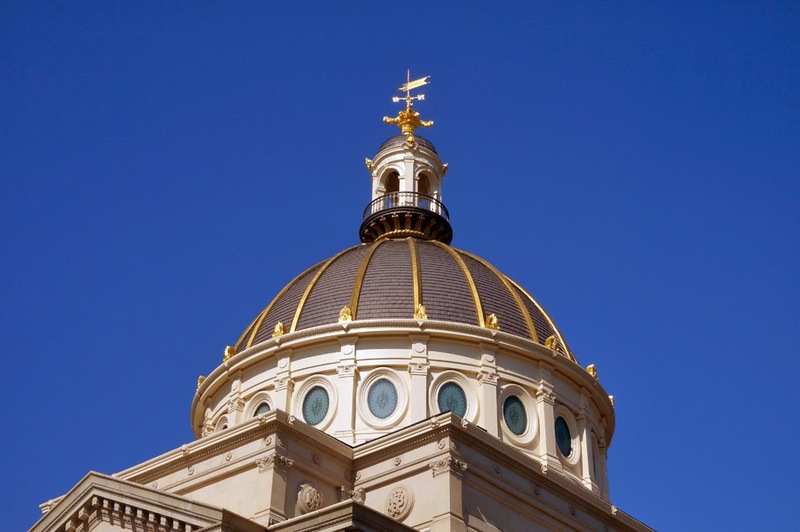 Prior to restoration work by Platt Byard Dovell, the 20 monogramed oval windows in the drum below the dome had been covered with plywood, likely due to the blackouts of World War II. Except for the neon sign on the exterior of the bank, few of the building's elements were changed during the first restoration. The second and more extensive restoration began after its last owner sold the building in 2010. Murals were cleaned and restored, new encaustic tiles matching those in the original floors were ordered, reproductions of the WSB monogramed door knobs were made from casts taken from the originals and the bird cage elevator was resurrected. In addition, the revolving door which had been installed at the main entrance while the building was still in use as a bank, was replaced with a replica of the original wood framed doors. A facsimile of the doors was made possible with the use of a historic photograph. The $27 million restoration project was awarded a Lucy G. Moses Preservation Award. The bank building's latest restoration work was undertaken as part of a development project to repurpose the structure for an event space and banquet hall connected to a future hotel. Sitting in the shadow of the Williamsburg Bridge and across from Peter Luger Steak House, the new event space is in a prime location for the development. 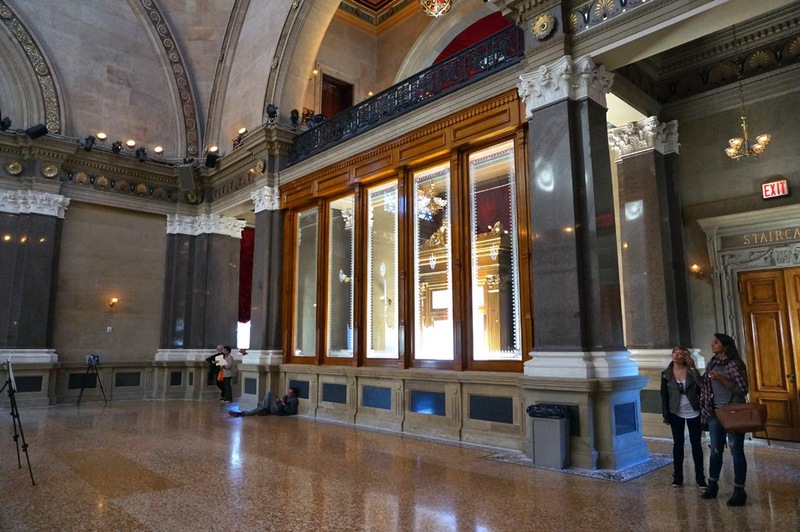 Seen in the slide show above is the restored interior of the bank including the bird cage elevator, hinge & door knob castings, tile floors, domes and various other features. 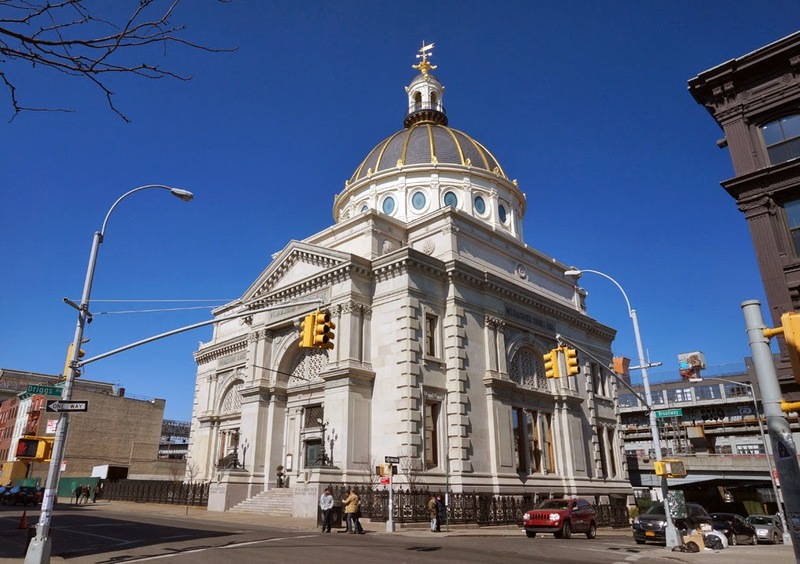 After touring the interior of the Williamsburg Savings Bank - Weylin B Seymour's, I have to say that the current owners deserve a lot of credit and all of the accolades they have received to date for their work on the building. Kahn, Eve M. "50-Year Dark Age Ends in Brooklyn" New York Times. 4 May, 1995. 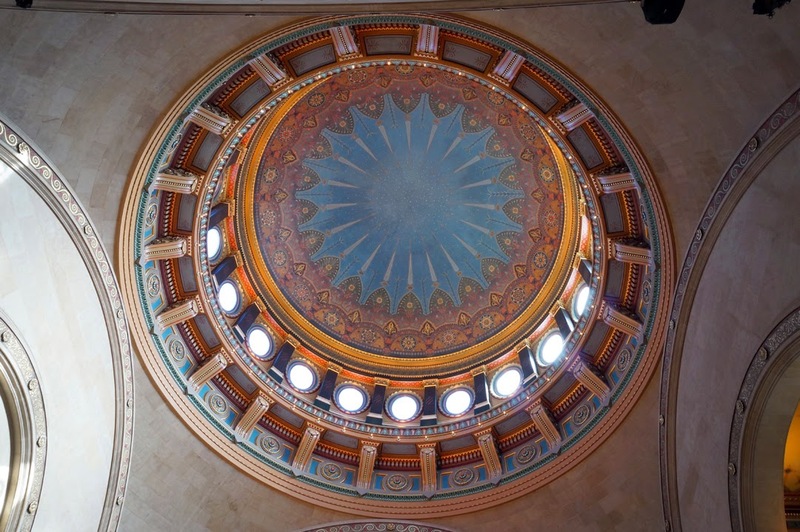 "A Landmark Restored, From Mosaic Marble Floor to Grand Dome" New York Times online. 12 March, 2014. 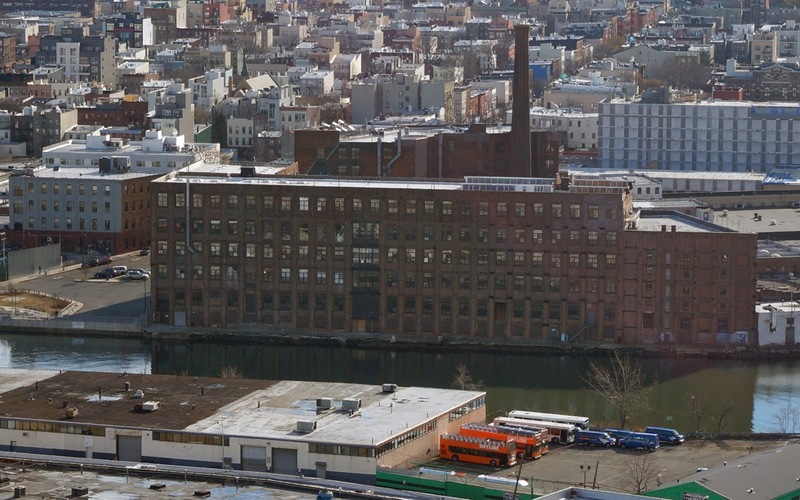 Adjacent to Manhattan Avenue Street End Park is the Greenpoint Manufacturing and Design Center (GMDC). The GMDC was once home to the Chelsea Fiber Mill, a maritime rope factory that supplied rope to the local ship building industry and the U.S. Navy. The Chelsea Fiber Mill was built in 1868 with Charles Pratt among the Brooklyn Businessmen invested in the company. From 1868 to 1903 the Chelsea Fiber Mill expanded, gradually adding structures until a total of 8 buildings were constructed. Included in the complex's Victorian era brick buildings was a steam generator - the smoke stack of which can still be seen rising above the complex. After the end of WWII ship building technology evolved and the need for the rope supplied by the fiber mill declined steadily and eventually the company went out of business. After the factory closed the buildings fell into a state of disrepair and by the 1970s the structures had damage ranging from broken windows to collapsing roofs. The city took ownership of the property in 1972 when the owner, Grossen Dye Works, failed to pay their taxes. In the years that followed, the city attempted to market the property to real estate developers and when they were uninterested developing the site the city considered demolishing the buildings. In the 1980s a small contingent of artists and woodworkers were allowed to rent space in the buildings on a month to month bases provided that they did all of the maintenance of their spaces themselves. The structures were described by one of those tenants as a "wasteland". Tenants, eventually fed up with conditions in the complex, banded together and formed the Woodworking Center Equity Corporation to manage the complex and negotiate leases. 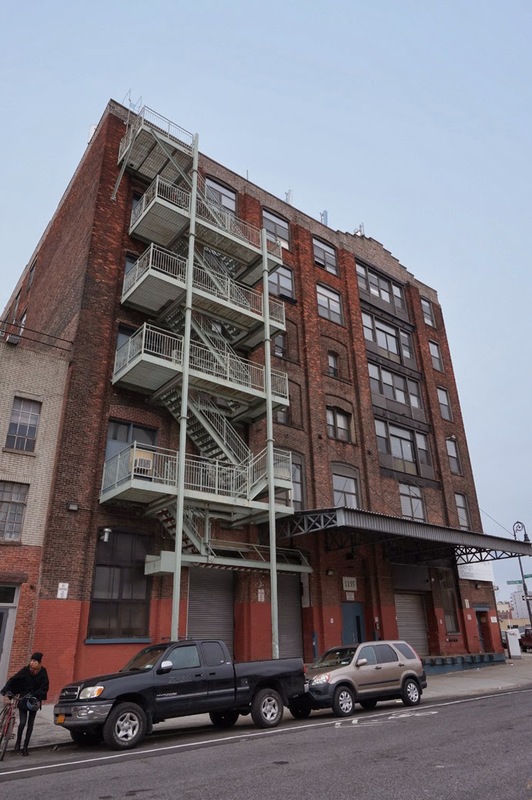 In 1992 Mr. Niswander, the head of the tenants group and David Sweeny, the director of economic development for the North Brooklyn Development Corporation, incorporated the Greenpoint Manufacturing and Design Center. The GMDC applied to buy the complex from the city in order to create an Incubator for local artists and craftsman. After a series of battles with city agencies the complex was sold to the GMDC for $1 and city promised to set aside $1 million for safety improvements. Today the GMDC stands as a model for urban revival and economic development and is the only non-profit industrial developer in New York City. The organization's goals are to keep rents affordable for artists and artisans and to preserve light industry in urban areas by acquiring, developing and managing industrial real estate for small to medium sized manufacturing enterprises. In addition to affordable rent, the GMDC provides job training and a communal environment, creating a competitive edge for its tenants. Among the list of tenants are furniture makers, fine artists, graphic artists, film makers and interior designers. Those familiar with north Brooklyn may recognize other GMDC buildings in various neighborhoods. In addition to the building complex at 1155 Manhattan avenue pictured here, the GMDC managed buildings include buildings at: 221 McKibbin Street (Bushwick, adjacent to the infamous McKibbin Lofts), 810 Humboldt Street (Williamsburg), 7 St. Nicholas Avenue (Bushwick) and 1102 Atlantic Avenue (Crown Heights). 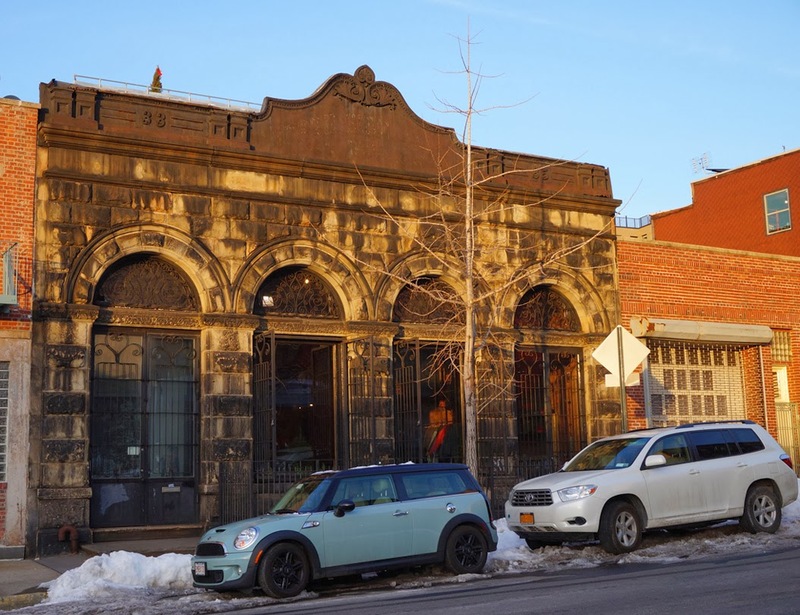 Although, not included in GMDC's list of buildings, according to a Daily News article from December of 2000, the GMDC was to lease and renovate the Pencil Factory building at 37 Greenpoint Avenue. 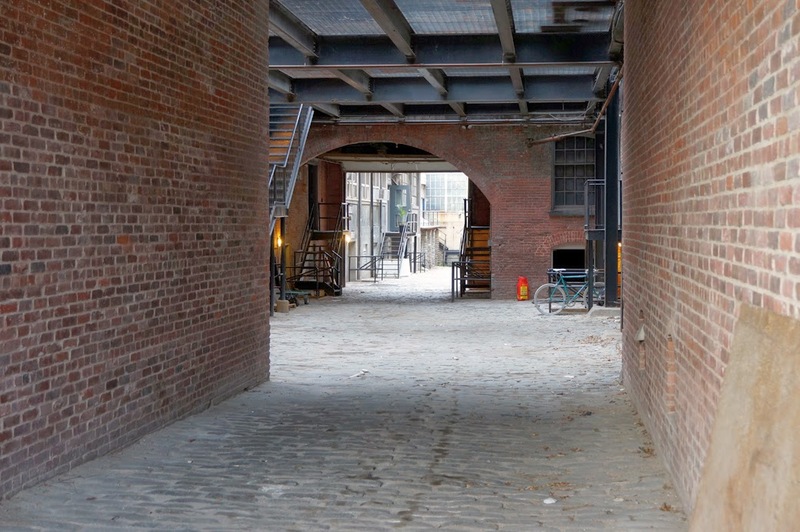 Looking toward the future of the Chelsea Fiber Mills complex, the GMDC has partnered with the North Brooklyn Boat Club with plans to restore the bulkhead and provide waterfront access for pedestrians and maritime recreation. The planned renovation of the waterfront side of the complex would extend waterfront access from the planned residential developments along the East River and Newtown Creek to Manhattan Avenue Street End Park. Architectural rendering for the planned work can be found on Untapped Cities. Prud'homme, Alex "Off the Urban Rust Heap, a Factory Goes to Work" New York Times. 10 January, 1999. 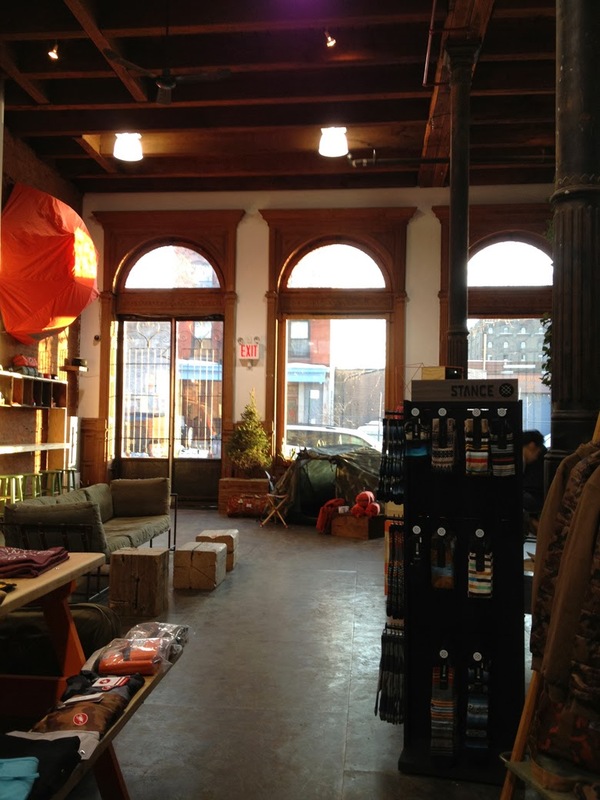 "The Greenpoint Manufacturing and Design Center" Untapped Cities. Online.11 May, 2012. Allen, Michael "Penciling in new firms for old factory" Daily News. 27 December, 2000. Near the western terminus of Grand Street sits the small 600 square foot Northside Savings Bank building (built 1889). Designed by Brooklyn architect Theobald Englehardt, the bank utilizes a rusticated stone facade with large arched windows typical of the Romanesque Revival style of architecture. In addition, the building has a cast-iron cornice rarely seen in Williamsburg structures. Some of Theobald Englehardt’s other Brooklyn buildings include the Greenpoint Home for the Aged, Saint Johns Evangelical Lutheran Church, and one of the buildings in the Pencil Factory Historic District. The Northside Savings Bank sits near what was once the focal point of a street that used to be the dominant commercial route through the neighborhood. Where Grand Street meets the East River, at what is now Grand Ferry Park, there used to be a ferry landing that helped to make the street the main thoroughfare. However, when the Williamsburg Bridge opened, the primary commercial route shifted to Broadway. Above the arched windows sits the cast iron cornice. If you enlarge this photo, you can see where the bank's moniker used to span the center portion of the cornice. The interior of the building has a beauty equaling that of the facade. Cast iron columns support wood beams and joists and the large windows are bordered with ornate carved wooden frames. The size, location and aesthetic of the old bank building seems make the structure an ideal place for a Brooklyn boutique. The outdoor recreational products seen in the photo above belong to the bank building's current tenant, Poler, a Portland based outdoor gear company. Whatever the future of the building will be, one can only hope that the architectural integrity of the structure will continue to be celebrated and preserved by its owners and tenants. "Neighborhood at Risk: Williamsburg" Historic Districts Council.